Having a great clubhouse atmosphere may not be as important as having a lot of talent, but it doesn't hurt, and it helps explain why these teams look poised for success in 2016. SURPRISE, Ariz.—Tis the season for “changing the culture.” It’s the time to welcome new players (and sometimes a new manager or general manager) and start over again with a clean won-loss record. The more accurate phrase, as an homage to the work and time true change requires, is “establishing the culture.” But know this: Culture matters. What is a good culture? It’s stability, but it’s more than that. It means strong ownership that lets baseball people do their jobs. It means a working marriage between the general manager and the manager (disagreements are okay; grudges are not). It means players trust the manager. It means superstar players hustle and don’t operate with entitlement. It means young players are accepted as equals and not forced to “pay dues.” Above all, it means all parties subjugate their personal agenda for what is best for the team. A strong culture is one that is in place right now, not one that may or may not develop over the season. It means every new player, whether promoted from the minors or acquired from the outside, knows exactly how to act—without wanting to be The New Act. You might be surprised how few major league teams actually have an established culture. Most all teams talk about it, but real trust takes time. The Nationals, for instance, have lacked a strong culture for years, and manager Dusty Baker, the man hired to change it, needs more than just the contrived competitive environment of spring training to get his group to coalesce. Oakland once had a strong culture, but lost it with its constant churn, ending up with a miserable environment last year. The Marlins, baseball’s eternal renters, never did have a culture, operating with a boom-or-bust, almost month-to-month existence. Jumping from camp to camp in Arizona and Florida, I often am struck by what organizations have the intangible advantage of a strong culture and those that keep chasing one. With the added opinions of several general managers and executives, I came up with this list of teams with the hidden edge: the five best cultures in baseball. Yes, winning the World Series helps, but Kansas City would top this list even if it lost to the Mets last fall. The Royals have the advantage of homegrown talent, many of whom have played together since the minor leagues. But they also have a well-defined, unselfish way of playing baseball (athleticism, defense, putting the ball in play and a deep bullpen). “I’ve never been around a team like this in my life,” manager Ned Yost said. “Every single one of them wants what’s best for the team. Mike Moustakas, a run producer, is asked to hit second. Alex Gordon, an All-Star, is asked to bat eighth. Chris Young goes back and forth between starting and the bullpen. Jarrod Dyson, Paulo Orlando … nobody [complains]. It doesn’t matter who it is, they all are willing to do whatever it takes to win. “And [GM] Dayton [Moore] has done a great job bringing in only the guys who fit in. We do a lot of due diligence. No matter who it is—Kendrys Morales, Ben Zobrist, Johnny Cueto, Ian Kennedy—we make sure we ask around about their character. And there have been times we have flat out said ‘no’ and walked away from a player for that reason. I said at the time the biggest free agent signing after the 2014 season was the Cubs’ acquisition of manager Joe Maddon. (Conversely, the Dodgers—under Maddon’s old boss in Tampa Bay, Andrew Friedman—held on to incumbent Don Mattingly, costing them a chance to getting Maddon. They parted ways with Mattingly only a year later and have since put the high-maintenance, still-no-defined-culture team into the hands of a rookie manager in Dave Roberts.) What makes Maddon a genius is that he encourages individualism but always within a team concept. No team has more fun working hard than the Cubs. (One of the latest of Maddon’s million mottos: “Do simple better.”) Maddon can seem like a goofball Zen master at times, but deep down, he’s a hard-bitten player development guy who loves to learn and teach. Moreover, first baseman Anthony Rizzo and ace Jake Arrieta are born leaders guided by humility. People disregarded culture when they knocked outfielder Dexter Fowler for “misreading the market” or “signing for less than the qualifying offer he turned down.” Yes, he expected a better market. But if you saw the smiles and joy on Field 6 at the Cubs’ training site last week when Fowler made his surprise re-entry, you understood this wasn’t about “maximizing dollars” or “getting true market value.” It was about being happy in an established culture. Pitcher Jeff Samardzija probably has smiled more times just this spring training than he did all of last year, when he posted a 4.96 ERA, lost the sink to his pitches and clashed with the White Sox' staff about pitching philosophy. As with the Cubs, the Giants encourage freedom to be one’s self. Quirkiness is embraced. Veterans, many off down years, almost immediately do well when they join San Francisco. The backbone of the franchise is stability in ownership, the front office and the dugout. And the franchise’s superstar player, Buster Posey, goes about his job with the diligence and hunger of the 25th man on the roster. This may be pure coincidence, but here goes: From 2005 to '15, only two franchises have not had a player hit 30 home runs in a season. Those would be the Royals and Giants, who have combined to win four of those 11 World Series championships. They have won more games over the past three years than any team in baseball except St. Louis, yet they have not won a division title or a postseason series in that window. They know exactly what they are: a team led by a humble superstar, Andrew McCutchen, that relies on 20-something position players and rebuilt veteran pitchers in a system under pitching coach Ray Searage that worships the ground ball. The Pirates play comfortably with a thin margin for error. Here’s the risk: Without spending the extra bucks on a big-ticket item that could put it over the top and while waiting for its next wave of prospects to arrive, Pittsburgh may get no titles to show for this steady culture. If so, the defining moment for this group will be Sean Rodriguez madly punching the dugout cooler last October in yet another postseason elimination game. The Cardinals do a fantastic job integrating young players into the culture so that they are comfortable enough to contribute right away. And with eight straight winning seasons in which they have averaged 91 victories, the Cardinals are a model franchise when it comes to consistency. They don’t rate higher here because they lost their best player (Jason Heyward) and best pitcher (John Lackey) to the rival Cubs and because they could not convince free-agent starter David Price to sign with them. Heyward cited, among other reasons, more like-aged young stars on the Chicago roster. The grinding, serious tone set by manager Mike Matheny needs the Tony La Russa-like payoff of a world championship. Honorable mentions: Toronto Blue Jays and Tampa Bay Rays. Executives admired the hard-nosed swagger Josh Donaldson and Russell Martin gave the club last year, but the Jose Bautista contract morass is potential trouble. The Rays received support because, like Pittsburgh, they know exactly what they are and don’t deviate—though sometimes, as with their quick hooks on starters based on third-time-around metrics, that obstinacy can work against them. It’s not a good sign when some of your own position players don’t buy into those formulaic hooks. Almost there: Houston Astros, Texas Rangers, New York Mets. One last word on the top five cultures: the PECOTA projection system of Baseball Prospectus, a number-crunching marvel that doesn’t care about culture, typically sells all of them short. Over the 2014 and '15 seasons, PECOTA was short on the win totals for Kansas City, Chicago, San Francisco, Pittsburgh and St. Louis by an average of 9.2 wins—not once overestimating them. The strike zone remains unchanged—for now. After considering in January a plan to raise the bottom of the strike zone from mid-knee to the top of the knee, MLB does not anticipate any change by Opening Day this year, according to an industry source familiar with those plans. The idea was under consideration because of two reasons: the decline in offense over the past decade and the way pitchers are pounding the bottom of the strike zone with velocity while getting called strikes. At ownership meetings in January, MLB defined the trend with startling numbers. From 2008 to '15, the average height of a pitch declined from 28.7 inches to 26.9 inches—about two-thirds the diameter of a baseball. In that span, average fastball velocity increased from 90.8 mph to 92.1. 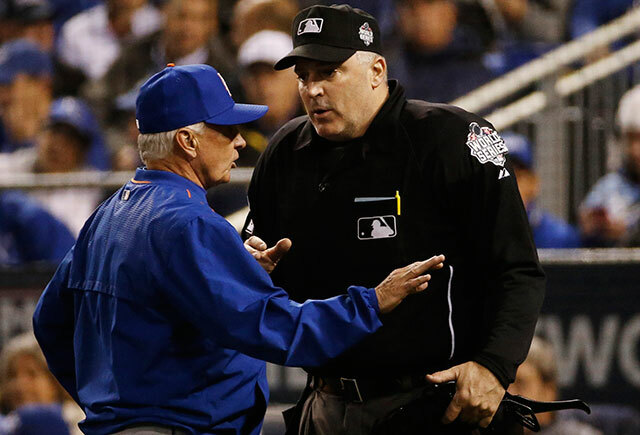 MLB simply isn’t ready to change the rules to help offense. Baseball officials were encouraged by the uptick in offense over the final two months of last season and prefer to see if that was the start of a trend or an aberration. •​ Here is one GM’s interesting take on one of the most fascinating free agents who changed teams this winter: “Jordan Zimmermann will be interesting to watch. We looked at the [medicals] and moved on.” Though Zimmermann just signed with Detroit (five years, $110 million), he is the key pitcher to the next three free-agent classes. Now 6 1/2 years removed from getting his UCL rebuilt, he is the canary in the coal mine for Tommy John survivors. How he holds up in the early years of the contract are important, because some of the best pitchers in this first generation to undergo Tommy John surgery at such a young age will be hitting the market: Stephen Strasburg after this season; Yu Darvish, Lance Lynn and Alex Cobb after next; and Jose Fernandez, Matt Harvey and Patrick Corbin after 2018. • Mets GM Sandy Alderson had the best line about rehabbing pitchers from Tommy John: “Fifteen months is the new 12 months.” It wasn’t too long ago that pitchers were trying to set records getting back on the mound quickly. In 2008, for instance, Josh Johnson made it back to the Marlins just 11 months after surgery. He blew out his elbow again six years later. Alderson kept Harvey off an MLB mound in September 2014 to give him more time to recover, and other teams are following the slower-is-better philosophy. The Rangers, for instance, schedule built-in breaks for their Tommy John patients on their road back, which is what they did with Darvish. The ace underwent surgery in March of last year and is on a tentative track to return in mid-May, about 15 months after surgery. •​ The White Sox are looking at Jimmy Rollins exclusively as a shortstop, because their other infielders (Tyler Saladino, Brett Lawrie, Leury Garcia) are all better equipped to move between second and third if needed. If Rollins doesn’t win the starting shortstop job in Chicago, the Giants have interest in him as a reserve infielder—and Rollins, who is from the Bay Area, might prefer his hometown team if he’s not a starter. •​ Oakland manager Bob Melvin saw a ray of light in an otherwise second straight down year by designated hitter Billy Butler in 2015: “September, he made some adjustments. He used the whole field.” Butler hit .300/.364/.509 in the last month compared to .238/.313/.360 before that. •​ Mike Trout has talked about stealing more bases, but he should forget it. At a time when stolen bases per game are the lowest since 1973, and with Trout hitting mostly third in the batting order, the Angels don't need their franchise player attempting more than a few more steals above the 18 he tried last year. Los Angeles is a longshot to win the AL West, but it has no shot without Trout, so asking him to steal 49 bases again, as he did as a rookie, is a foolish risk.